Newly promoted El Sharkia SC are making arrangements to bring Nigerian striker Chidiebere Okoye back to Egypt , Soccernet.com.ng reports. Okoye has been without a club since he left his Cambodian side few months ago, and despite getting interests from clubs in Asia he has chosen to return to his former club, El Sharkia. “My former Club wants me back and I’ll like to join them. The deal will be concluded very soon if everything goes well ,” Okoye told Soccernet.com.ng. 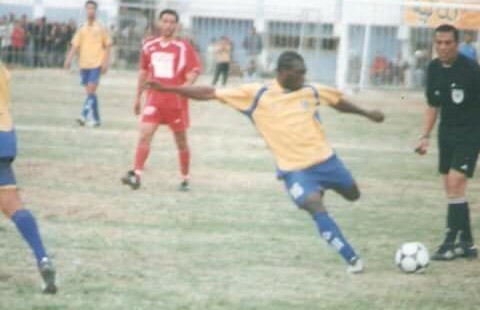 Okoye started his youth career with Pepsi academy and Ikeja United, he later went on to join BBC Lions of Gboko for a season before he moved to Egypt to play for Zamalek. In 2010, he went to Qatar to play 2 years with Army FC. He also played in Indonesia for Persikad and most recently in Cambodia for Boungket FC. The 33-year-old who could be an asset to the Super Eagles was named the fastest and best player in Egypt for three consecutive years (2003-2005) and the most skillful Striker in Egypt.